Last year I featured GeoNB, New Brunswick’s approach to publicly available geographic information for the entire province of New Brunswick [see the previous article here if you missed it]. This valuable resource by Service New Brunswick provides a robust web mapping application, value-added products, various applications and extensive collection of open source data sets. 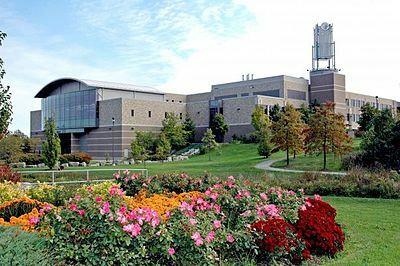 Not to mention an outstanding web GIS application that stands out from others and one that earned them an Esri Canada Award of Excellence award last fall at the Esri User Conference in Fredericton. GeoNB currently includes a wide variety of data sets for the entire province including digital topographic layers, orthophotos, property maps and much more. 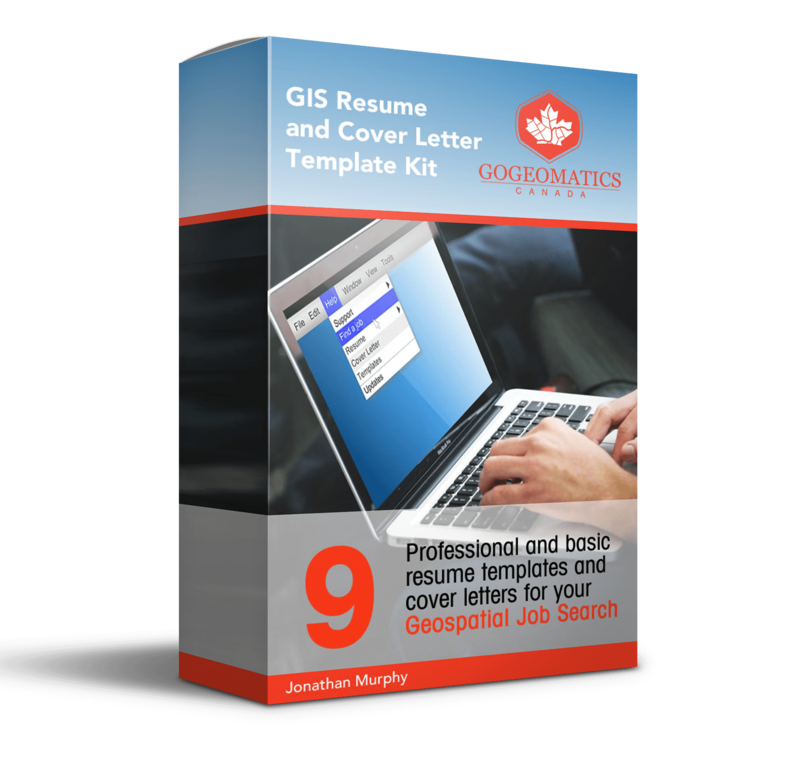 On top of having one of the best online mapping applications available they also provide access to download any of these digital data sets in a variety of formats for people to use in their own GIS software packages. Over the past 4 years public usage of New Brunswick spatial data has increased significantly, with the average traffic to the site increasing from 5 thousand to over 13 thousand visitors every week. 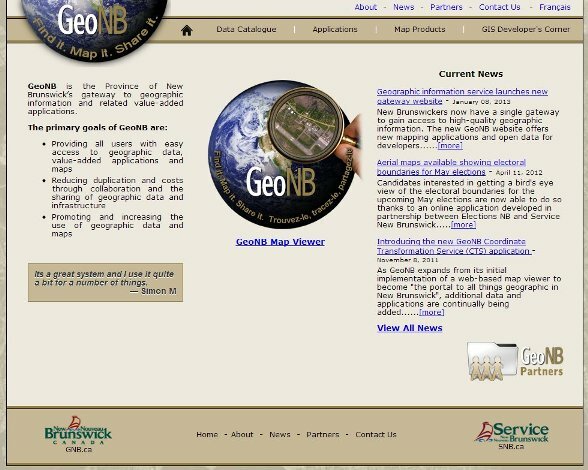 To meet the growing demand, they recently upgraded their geographic information gateway, building upon existing GeoNB initiatives and ensuring that residents of New Brunswick have easy access to geospatial information, pre-built maps and free online applications . Basically the new site becomes the “All Things Geographic” place for New Brunswick’s geographic content consolidated and organized into one easy to use location. An initiative that helps encourage the creation of new geospatial products and solutions from geographic data that has been collected, maintained, and distributed using open data accepted standards. The new geographic portal is visually pleasing, well laid out making it easy to navigate and appeals to a wide audience. Everyone can take advantage of this free service from home owners that would like to know more about their property, developers seeking better sites for development, and those more advanced GIS users that want to use their own GIS software. There are some new geospatial applications that were designed to support various ongoing government programs including wetland conservation, flood damage reduction, protected areas management, as well as a coordinate transformation service that converts coordinates between datums and map projections. There are 4 key sections that include the Data Catalogue, Applications, Map Products and the new GIS Developer’s Corner. Each section will continue to grow and develop with new datasets and tools as inferred by the GeoNB Action Plan. The Data Catalogue contains over 35 different geographic datasets in a wide range of formats that are available to download free. Here they simplified things pretty well making data very easy to find. Using a table format they provide the name of the dataset, link to more info about it, thumb nails for quick view, date the data was created, formats available and links to download data. This will be the section that most GIS people looking for data where go to. The Applications section provides access to over 10 custom designed applications that combine datasets and value-added functionality. 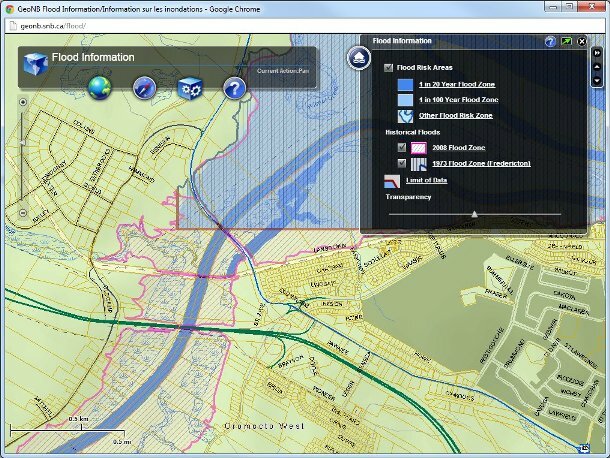 These tools have a broad range of uses but have mainly been tailored to different intended users and include everything from the popular web map viewer (read more details about the map viewer here) and Coordinate Transformation Service to more specialised viewers aimed at those in Oil and Gas or Wetlands Mapping. Certainly worth a look if you are just curious about learning more about New Brunswick. The Map Products section contains more pre-made value-added off the shelf mapping products such as static maps that have been generated to convey certain information. Again here they offer a broad range of products tailored to different intended users; but unlike most of the other products on the site, these are more traditional finished map products. This section will appeal more to those that need maps but do not have the ability to create their own. The GIS Developer’s Corner is a place where people can leverage more geomatics technology and intelligence making use of some applications that allow them to go beyond the basic functionality such as using the open data sources as a live map service instead of downloading (this is one of the features that I like and now use when generating maps for area in New Brunswick). GeoNB utilizes ESRI ArcGIS Server and has made data available as ArcGIS Server map services to those that have the ability to take advantage of it. So I am sure by now you get the idea. Once again the team at Service New Brunswick have done a great job promoting and increasing the use of geographic data and maps in New Brunswick. From a new easy to use new geographic portal (in both French and English) that provides people with plenty of data and a wide range of robust applications GeoNB continues to stand out among the rest. But again don’t just take my word about it, go over to the new portal your self, make use of some of the data and tools and let the folks at Service New Brunswick know they are doing a great job. A collection of historical maps and plans of Fredericton, New Brunswick are freely available to the general public.They have been georeferenced so that they can be visualized with various mapping applications (Google maps, Bing maps, Google Earth, ArcGIS etc. ), includes metadata and tools for searching have been incorporated. 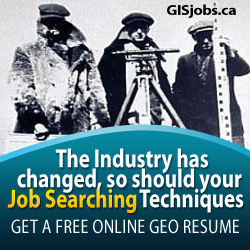 CARIS, an industry leading marine GIS organization based out of Fredericton, New Brunswick has designed and built software solutions for over 30 years. Recently they announced their release of CARIS OSCAR-js (Open Spatial Component Architecture) , their first open source Application Programming Interface (API). The API was created to help shape CARIS Spatial Fusion Enterprise and includes tools for navigation, measurement, and download, as well as providing a means for developers to create their own custom tools and extensions. OSCAR-js extends the very popular OpenLayers library and utilizes jQueryUI and YUI to help create a feature rich mapping experience. 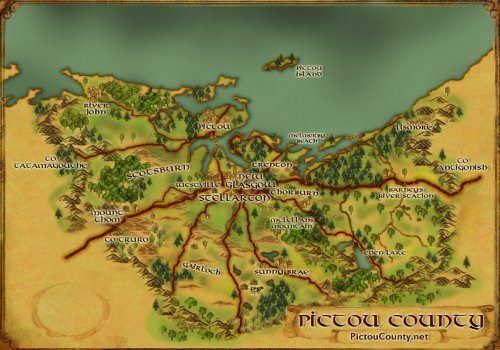 The API is designed around the creation of map themes. Map themes consist of thematic maps along with optional functionality such as selection, data download or more. OSCAR-js supports the use of Open Geospatial Consortium (OGC) web services including Web Map Service (WMS), Web Map Tile Service (WMTS), Web Feature Service (WFS) and Web Coverage Service (WCS) for creating these map themes. In addition to supporting OGC web services, OSCAR-js can connect to CARIS Spatial Fusion Viewer to load map configurations. This allows for centralized site management for your web map infrastructure. 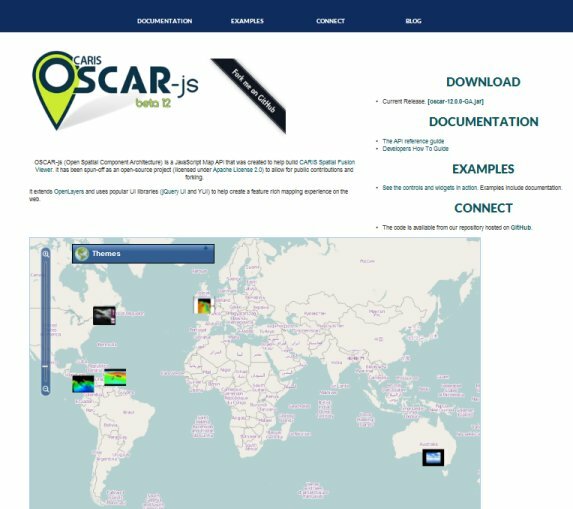 Consider trying CARIS OSCAR-js API with your own spatial mapping data and applications, to get started, visit the OSCAR-js website where you can get helpful documentation, a basic tutorial, code samples, and a blog with all the latest information about OSCAR-js. And don’t forget to let us know about your web mapping application that you created with CARIS OSCAR-js API.